This winter has been shockingly mild, which could be considered both good and bad, depending on your personally-held views on climate change. Either way, I still have a pretty bad case of spring fever. I’m ready to get into the soil and the garden and back onto my beloved Kentucky farms for a new season of fun interviews. Thankfully, March is going to be the perfect month for farm-themed events in Kentucky. My calendar is already full of fun things to do, and I am sure you will find something to do, too. These are just the highlights, so check out the SK calendar for more events near you. March 8: Third Annual Count Cashmir Pulaski Dinner at Alfafa Restaurant in Lexington. Pulaski, for whom my home county of Pulaski was named, was a Polish Army officer who volunteered to fight for democracy in the American Revolution. Alfalfa’s Paul Nowaki and Alex Jenkins will honor the Count will a menu which will include local Stonecross Farm Kielbasa, House-made pierogies, Polish beer and more! While the dinner may not be specifically farm-themed, Alfafa is an iconic Lexington restaurant that supports local farms. Rona Roberts of Savoring Kentucky and I will be there feasting on this delicious tribute to this unique historical figure. Join us! This event, which only costs $10 per person, has a great lineup of speakers as well—including the Wiedigers and Susana Lein again! (Yes, it’s true, Kentucky farmers never rest.) If you are near the eastern half of the state, you need to make it a point to attend. Support the movement so that events like this will continue to happen across our state. March 16th: Mushroom cultivation workshop at Forest Retreats in Berea. I am obsessed with mushrooms, and growing them seriously has long been on my to-do list. In the past, I’ve dabbled here and there…. but the quantity of mushrooms my family consumes really necessitates that I get serious and start growing mushrooms on a regular basis. I really need someone to walk me through the different varieties and production methods, and Tim Hensley and Jane Post are (I’ve been told) just the folks to make this happen. Tim & Jane host a few workshops a year—including morel harvests!—and have graciously agreed to let me attend one so that I can share my journey with you here on the blog. I am so excited about this opportunity and hope that you will join us on March 16th or for one of their other workshops. You can learn more about the day and pricing on their website. Hope to meet you there! March 23rd: Raising Heritage Poultry for Profit and Pleasure Workshop at Fowl Play Pastured Poultry in Cadiz, Kentucky. A workshop for sustainable poultry farmers interested in breeding, growing, and selling heritage poultry. A great event for those on the far western part of the state! I’ve been chatting with the folks at Fowl Play who are helping to organize the event with the Sustainable Poultry Network and it is going to be great. They are very passionate about their cause! Contact them for pricing and registration info. 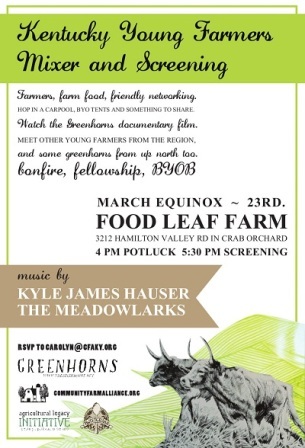 March 23rd: Community Farm Alliance Young Farmer Mixer at Food Leaf Farm. Food Leaf Farm is the farm of my awesome friends who own Sweetgrass Granola. They’ll be screening the documentary Greenhorns. If you are a young farmer and are not yet a part of CFA Ag Legacy, PLEASE go to this event. You will leave feeling reenergized and with an amazing group of new friends who want to support what you are doing. 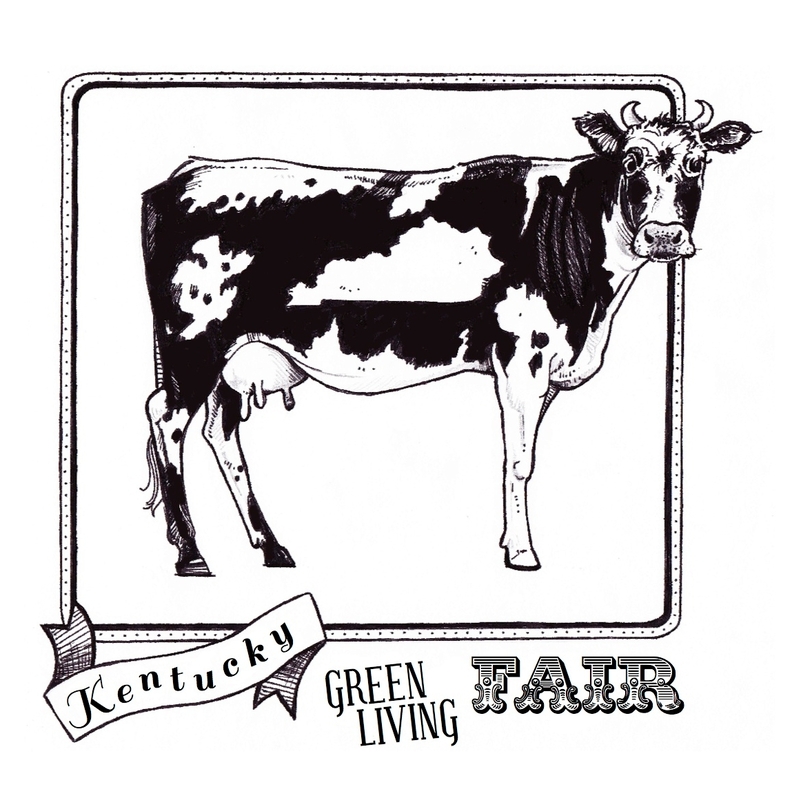 March 30th: Kentucky Green Living Fair in Somerset. The first event that we’ve put together here at Sustainable Kentucky, and I couldn’t be happier with how it is turning out. We’ve got 50+ vendors and exhibitors from around Kentucky, plus workshops, demonstrations, live music, local food, and more. $5 per person/12 and under free. I really hope that you will join us. It will be a great chance to catch up with old friends and make some new ones. With thanks to our amazing fair partners—Rough Draft Farmstead, Story Magazine, Tim Farmer’s Country Kitchen, Sweetgrass Granola, Good Foods Market & Cafe, and Eat. Local Food For Everyone. Also a shout to our sponsors— Rooibee Red Tea, River Run Farm & Pottery, Au Naturel Farm, Earthineer, Caught Wild Salmon, and Amish & More. Food by The Bluebird Cafe and The Wagon Trail. Music by the Millers. Still working on workshop scheduling, but topics include: organic gardening, composting, DIY solar, mushroom cultivation, beekeeping, fermentation, home dairies, real food, upcycled clothing, heirloom seeds, forest gardening, and more. Hope to see you there!